A young Latina mother is still shaken up following a racist confrontation in a home improvement store last week. City Pages reports that Guadeloupe Castillo was shopping with her three children at a Menards in West St. Paul, Minn., when she caught some bad vibes from a couple shopping in the same area. According to Castillo, her two kids had grabbed a seat on some patio furniture that was on display while she was trying to get her bearings in the store. That’s when the man she had felt uncomfortable around earlier confronted the children and told them they shouldn’t touch things if they weren’t going to buy them. Castillo was incensed—she says she knew her kids weren’t misbehaving and, she told City Pages, she felt that she should have been the one the man spoke to. After checking the patio furniture to make sure there was no damage, Castillo says she approached the man. “I told him, ‘If you see my kids doing something wrong, you talk to me, not them,’” Castillo said. “What did you just say?” Castillo says she repeated, turning her phone on to record the exchange. “You’re just dumb,” the man continued, shrugging off Castillo’s anger. “First of all, you told me don’t talk to your kids, talk to you. So I’m talking to you,” he added, as if telling someone to go back to Mexico were a perfectly reasonable, logical response. It wasn’t until another man called out his behavior that the racist Vikings fan jumped to attention. Then the man tried to reason that his beef wasn’t with Castillo’s Latina heritage but because her kids were misbehaving. 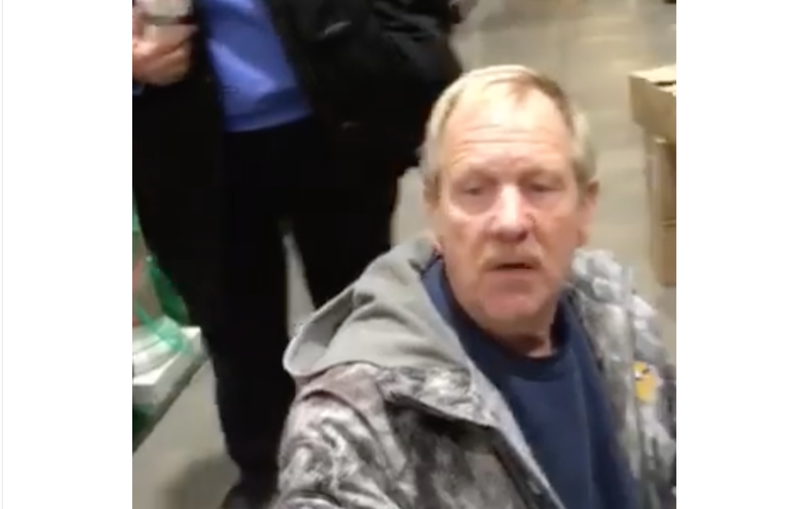 Despite being given multiple opportunities to explain why one of his first reactions was to tell Castillo to “go back to Mexico,” the Menards shopper never owned up to his racist comments. Castillo tells City Pages that, a week later, she’s still shaken up about the incident, and has yet to figure out how to explain it to her kids—who witnessed the entire thing. There have been many confrontations like Castillo’s captured and shared on social media this year, which has seen a rise in racist and anti-immigrant rhetoric and attacks. Many experts believe the increase is directly related to Donald Trump’s presidency. As Slate has noted, the Southern Poverty Law Center tracked 1,064 hate incidents in the first month alone following Trump’s election. Of those reports, 13 were later debunked as false, and 26 were reportedly perpetrated against Trump supporters—or 1.2 percent and 2.4 percent, respectively. Castillo, who says she has lived in Minnesota for 25 years, told City Pages that this was the first time anyone had ever spoken to her in such a racist way.